I’m usually adamantly against putting anything other than a collar or bandana on a pet (unless it’s an extremely ridiculous costume). I mean, they have fur for a reason. But I can’t deny the canine sized heavy metal gear from Party Animalz is INSANE! 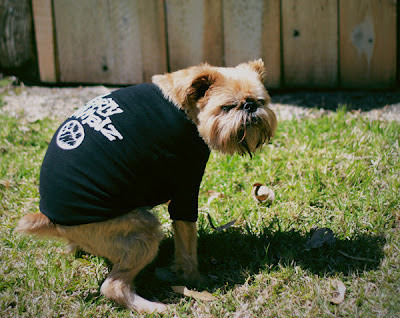 The “Original Logo” dog tee pictured above is pretty cool, but my favorite item has to be the “Heavy Metal” dog vest. The attention to detail, especially on the patches, is really nice. So if you own a dog, get on over to Party Animalz!